The Waves Dress is an asymmetrical design with a cross front bodice, A-line skirt and navy blue ruffle detail. 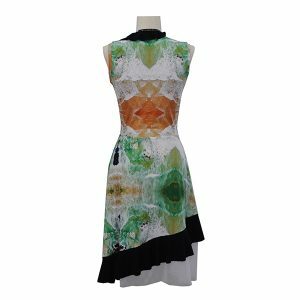 The dress is made in polyester jersey, printed in our exclusive fabric prints, with white tulle featured on the hem. The stretch jersey fabric makes the dress extremely comfortable to wear, it doesn’t crease or crinkle, is easy to wash and dries quickly .Check our size chart for your best size. Our exclusive fabric prints are designed by and printed for Zilpah Tart using photographs taken by the designer. For more information about our prints click here. The Golden Rocks Print was created using an aerial photograph taken near Broulee on the South Coast. The Rocky Shores Print was created using an aerial photograph taken near Broulee on the South Coast. The Sea Green Print was created using an aerial photograph taken at Forresters Beach on the Central Coast. 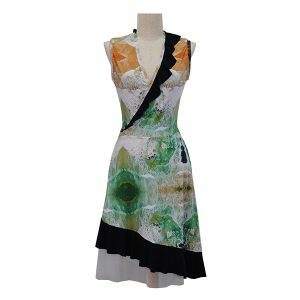 Pathway Dress in Museum Print – size 8 – Last Chance!